On 20 November 2018, in New Delhi, India, the Lancet Global Health Commission on High Quality Health Systems in the SDG Era co-hosted a national consultation with the Permanent Secretary of the Indian Ministry of Health and Family Welfare. 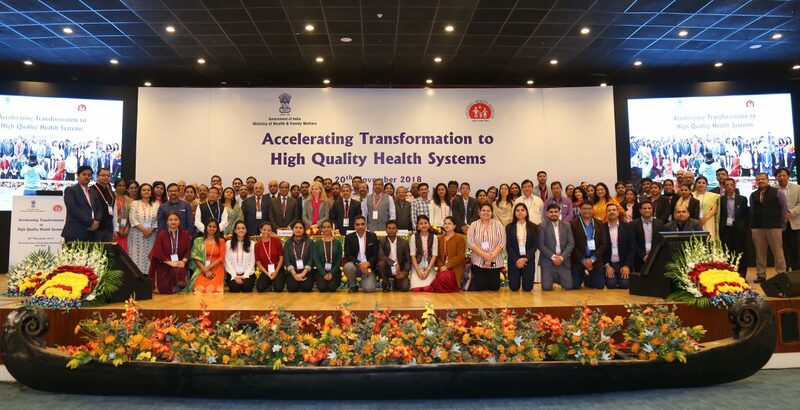 The goal of the consultation was to bring together delegates from the national and state ministries of health, academic institutions, and NGOs to chart a path forward for improving health-systems quality in India. The consultation came at an ideal time. The Government of India recently announced a landmark health policy called the Ayushman Bharat that will have two primary features. The first is the creation of widespread health insurance program for poorer households called PM-JAY and the second is the establishment of a large network of primary care Health and Wellness Centres. One of the main aims of the consultation was to build on India’s existing vision for better health and figure out how to incorporate health quality into the Ayushman Bharat program. The morning began with talks by some of the most important names in Indian health policy, including Ms. Preeti Sudan, Secretary of the Ministry of Health and Family Welfare, Mr. Manoj Jhalani, Additional Secretary and Mission Director of the National Health Mission, Dr. Vinod Paul, NITI Aayog, Prof. K. Srinath Reddy, President of the Public Health Foundation of India, Dr. Henk Bekedam, the WHO representative to India, and Dr. J.N. Srivastava of the National Health Systems Resource Centre. Dr. Margaret Kruk, Chair of the HQSS Commission, presented an overview of the Commission findings, the state of health quality in India, and some practical ideas for improving health systems quality in India. The morning session was attended by over a hundred delegates from across the country and set the stage for action in India. In the afternoon session, delegates split into groups to discuss the practicalities of implementing novel health quality reforms, including a health quality dashboard, national service guarantees, and a redesign of primary care. Building off of their diverse experiences, the teams rose to the challenge. Delegates presented innovative ideas to meet challenges such as rapidly collecting data on health quality, improving care standards, and building IT systems to better link primary and tertiary care. Delegates also emphasized the need for accountable governance and cooperation between the public and private sectors. The meeting was not meant to provide immediate solutions to the complex issues surrounding health quality in India. Rather, the consultation led to a dynamic dialogue between health experts and ignited an excitement from policy makers across all of India to place quality front-and-center in India’s upcoming health reforms. Nikkil Sudharsanan is a David E. Bell Postdoctoral Fellow in the Harvard Center for Population and Development Studies at the T.H. Chan School of Public Health.